Together with project partners Assisi Hospice, Dover Park Hospice and St Joseph’s Home and Hospice, Ang Chin Moh Foundation and Lien Foundation commissioned a rigorous study of the hospice sector in Singapore. Through ethnographic observations, design workshops and in-depth interviews with patients, families, care teams and experts, a critical new thinking and a refreshing vision with which to re-imagine future hospices and end-of-life care services was put forth, and in so doing, fundamentally reshape attitudes towards hospices and hospice care in Singapore. Over a period of nine months, fuelfor, an international design consultancy specializing in creating unique experiences in health care was commissioned to redesign in-patient hospices for the future with the end objective of expanding the boundaries of end-of-life-care and improve care for the dying, but more importantly initiate a new trajectory of hospice care and best practices and through this process, evolve the hospice into an essential, unequivocal and welcomed part of life services in Singapore. 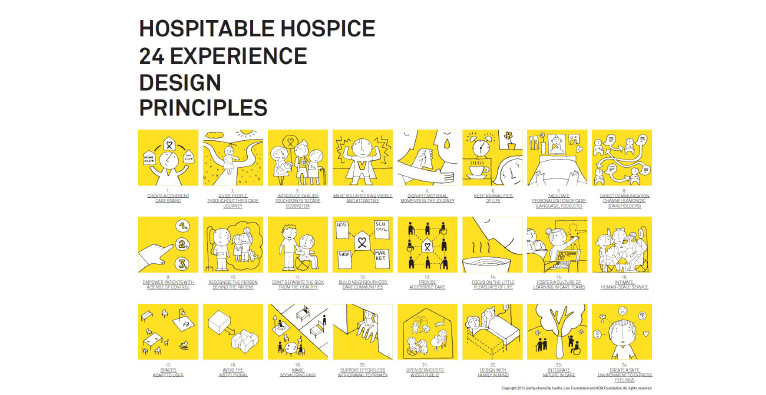 Seven key universal design concepts embedded with 24 design principles that sought to address the future hospice experience at multiple levels – policy, facility, community and the individual were proposed. In all, there will come a greater recognition of a human-centered, patient-orientated and staff-friendly “hospitable hospice” – from its physical design and environment to work processes and delivery of care. This first ever study was a bold attempt to shape attitudes and change mindsets toward dying and death and provided a new vision of hospice care in Singapore. It sought not only to support loved ones in navigating the end-of-life journey with confidence and ease, but it also enable communities to play an active role participating in end-of-life care. Patients on their part would also be empowered with a sense of control allowing their voices to be heard along their end-of-life journey. Family members and the general public would be more forthcoming and proactive in coming to terms with their mortality and the many issues surrounding dying, death and funerals in Singapore. The findings from the study have been encapsulated in a 145 pages guide entitled “Hospitable Hospice: Redesigning Care for Tomorrow”, it is made available to the Ministry of Health, hospices, hospitals, healthcare and tertiary institutions. Additionally, the guide is downloadable from the web, made easily accessible for the general public and extending the scope of its reach.